The City of Boston has issued a preparation notice regarding the major snow storm expected to bring 1-2 feet of snow starting on Friday morning into Saturday. 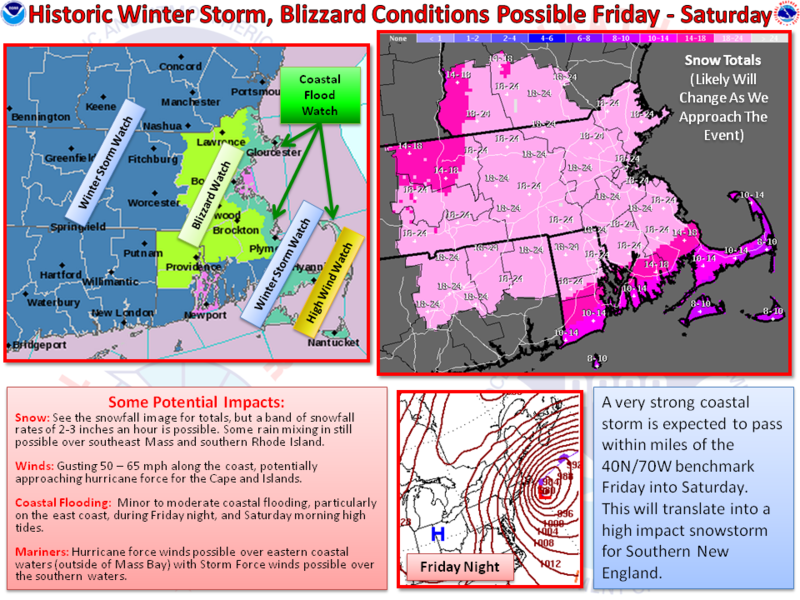 Mayor Thomas M. Menino today directed City Departments to immediately prepare for a winter storm that could bring potential blizzard-like conditions and hurricane-force gusts this weekend. The latest forecasts show that Boston could see 1-2 feet of snow between Friday morning and Saturday afternoon. Snow drifts of 3-4 feet are possible, and during the heaviest periods, expected on Saturday, snow could fall at 2-4 inches per hour. Coastal Flooding is also possible Friday night. The National Weather Service has issued a Blizzard Watch for Friday morning through Saturday afternoon. There is still a lot of uncertainty about the storm’s exact path, size, and duration. The City will continue to monitor the latest weather models and forecasts and will update the public with further information as it becomes available. Commuters are urged to pay close attention over the next 24 hours, in the event that the City urges them not drive their vehicles into the city on Friday. If the weather projections hold, the priority will be on giving Public Works crews room to work to plow the snow. Boston Public Works crews are preparing for the snow event, and will have almost 600 pieces of equipment active on City streets by early Friday morning. Crews are expected to be working through the weekend. The Office of Emergency Management is coordinating with city agencies, NSTAR, and the Weather Service to provide continuous updates to Mayor Menino. Boston Police, Fire, and Emergency Medical Services have arranged for additional staffing, and Police will be stationed at major intersections around the City. The Inspectional Services Department will double its shifts of inspectors working this weekend to deal with anticipated power and heat outages. The Boston Fire Department also urges residents to be careful if space heaters are used during the cold weather. The city has experienced several recent fires due to improperly used or malfunctioning space heaters. The Mayor’s 24-Hour Hotline will plan to have additional staff on-hand during the storm, and residents with weather-related questions or concerns, including down power lines, down trees or icy conditions, should call 617-635-4500. Residents are encouraged to use the City’s “Know Snow” program for access to other important storm-related information. To receive notifications, register for the city’s Alert Boston network at http://www.cityofboston.gov/alertboston/. If you would like to receive updates on the storm on Twitter you can follow us: @NotifyBoston.